Place your hands on your hips and square them to the front of the room by bringing your left hip forward and your right hip back. If you feel off balance here, you may need to adjust either the distance of your stance (feet should be about hips distance apart, maybe a little closer than hip distance) or the placement of your back foot may need to be adjusted so that you raise your heel up. Inhale and extend your arms over head in line with your ears. Be sure to keep your shoulders down and away from your ears and starfish out your fingers to draw muscularly down into your shoulders. Root your tailbone down to create length from your hips down through your legs. 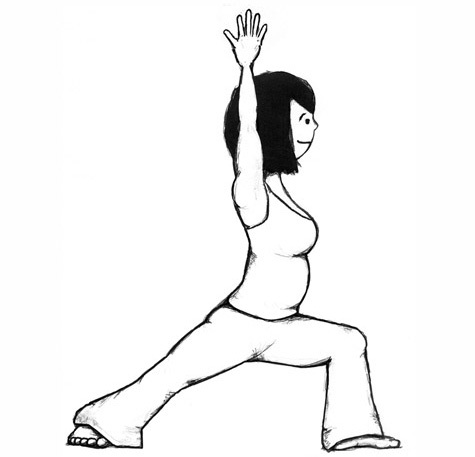 Hug and lift the top of your left thigh up towards the sky.